Jonah obeyed the Lord and went to Nineveh and proclaimed, "In forty days Nineveh will be destroyed!" The people of Nineveh believed God's message. So they decided that everyone should fast, and all the people, from the greatest to the least, put on sackcloth to show that they had repented. The story about Jonah and the big fish has always been a favourite with children. It has something of a fairy tale quality about it. It’s a story that appeals to the imagination. This is a story about one of God’s most reluctant prophets who is told to go to Nineveh – that hated, despised, despotic Near Eastern power that had caused so much suffering in Israel. Jonah is to preach against their wicked ways but he doesn't want to do it. The Ninevites had caused so much grief and pain to the people in the surrounding countries so why should he go there as God's messenger and call them to change their ways? They won’t change and Jonah didn’t want them to change. They only deserved God’s condemnation and punishment. Jonah knew that God was loving and merciful and that he was great on giving second chances (see 4:2) but as far as the Ninevites are concerned they don’t deserve a second chance? Why should such a horrible, cruel and merciless people be given the opportunity to repent and change their ways? Besides, people like that don’t change. Even though Jonah tries to ignore God's call and boards a ship for a place on the edge of the world, God persists and sends a storm and a big fish which swallows Jonah and rescues him from a briny death. In the belly of this fish Jonah relents and after three days Jonah is coughed up on the beach. Jonah walks through this enormous city calling out a simple message – not a call to repentance, not a message of God’s love, only a threat, “In forty days Nineveh will be destroyed!” It seems as if Jonah is making his message as offensive and as blunt as he possibly can. Was he trying to prove a point to God, “See, people like this don’t change”? Jonah wasn’t rejected as a crackpot. A miracle happens. The entire city from the king down to the poorest peasant believed God’s message. Even the sheep and cattle are involved. Everyone wears sackcloth and ashes and prays that God will not destroy them. This is a preacher’s dream. A whole city of people turning to God. the whole city fell on its knees in repentance and prayer. Jonah had only just begun walking through this huge city; with such little effort on his part the response was overwhelming. Jonah’s half-hearted efforts resulted in Nineveh’s wholehearted response. Jonah was wrong. People like that do change. The one person in the whole story who found it difficult to change was Jonah himself. Reading on further in the book of Jonah we find that he becomes angry and disgusted with God’s whole attitude in this affair. Jonah becomes angry because God is not. Jonah wanted justice not grace, punishment not forgiveness. In fact, by the end of the story we aren’t even too sure if Jonah himself changed. What are we to make of this whole story about Jonah? As I said at the beginning this Old Testament story makes a great story for children but what message does God want to convey to us today? Well, most importantly this is a story of God’s love and mercy. Look how often God was patient with the hard-headed and ignorant Jonah. If it was up to us we would have given up on this idiot long ago. We would have come to the conclusion that he will never change, he is too wrapped up in his own ideas and his own world that he will never change. He is too set in his attitude about the Ninevites about the judgement he thinks they deserve, it might be better to choose someone else. But notice how God comes back to Jonah again and again. He doesn’t give up. He rescues him from a watery grave and orders a big fish to swallow Jonah. He is patient with Jonah’s half-hearted effort in delivering his message, and to top it all off he hangs in there when Jonah becomes angry with God saying, “I knew it! I knew you would be loving and merciful. I knew that you would go back on what you said and save the people of Nineveh!” God was trying to convince Jonah that he loved the people of Nineveh as much as anyone else. God hasn’t changed one bit from the days of Jonah. We know how frustrated and impatient we can get with other people and so you can imagine how frustrated and impatient God must get with us. The way we hurt the people around us through our selfishness and lack of consideration and the way we hurt God with our sin must leave him upset and offended. And yet he doesn’t let this get in the way of his love and mercy and, like he did for Jonah, he comes back to us again and again wanting us to love him, trust him and turn our lives around from self-centredness and sin to lives of love, and patience and understanding. 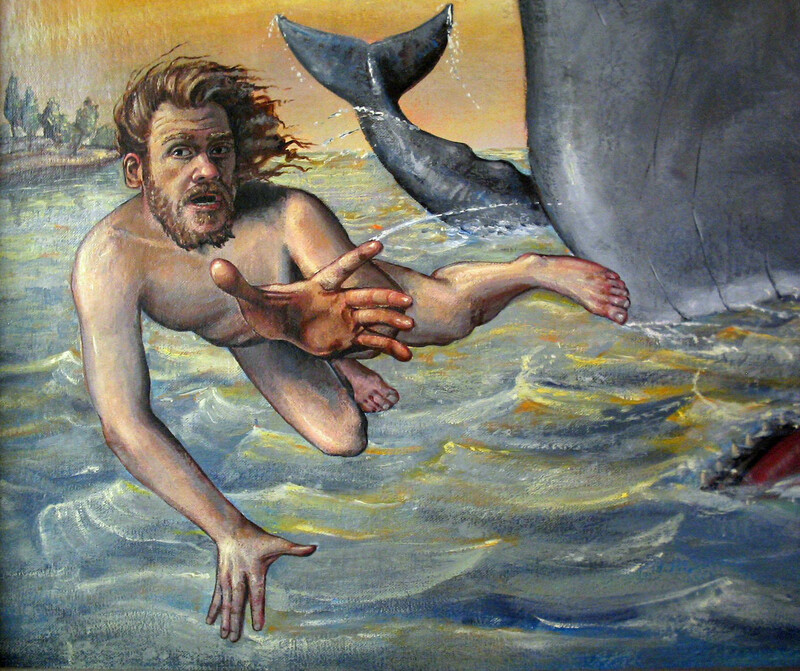 Just as God spoke his word through Jonah, as poor and inadequate as Jonah's effort was, he speaks to us through the Bible, through other people, through parents, neighbours and friends, calling us to trust him and believe in him as the God who loved us so dearly that he sent his Son, Jesus into this world to be our Saviour. The Son of God came to earth and from his earliest days on this earth, he was hated and hunted down by kings and rulers and religious leaders. He did this because of his love for us. He lived in this world and endured hunger, pain, thirst, sadness and death that he would not have endured had he stayed in heaven. He did it for us. He died, not a peaceful and quiet death, but with nails in his hands and feet, a crown of thorns pressing on his head, because of his love for you and me. He loves us, loves us, and loves us more and will do anything to ensure that we will live forever in heaven. Jesus has promised to walk with us all the days of our lives through the ups and downs. He has assured us that he will always be there for us to call on in times of sickness, sadness, trouble, even death. The love that God has for us is stated over and over again in the Bible. That’s how God felt about the people of Nineveh and grumpy Jonah. That’s the way God feels about you! But I don’t want to give you the impression that God is an old softie and that he will never condemn anyone. He does! Those who insist that believing and trusting in God is nonsense will one day face God’s disappointment and anger. And who can blame him. He has given us every opportunity to trust in his love for us and still people turn their backs on him. The other point that I wish to bring out is that people can change. There are those who say, “You can’t teach an old dog new tricks. I’ve lived without God, Jesus and the church for all these years, I can’t change now”. A counsellor of many years once said that the one thing he had learned in counselling people with problems is that “people almost never change. Change, real change, is rare.” Perhaps that counsellor was having a bad day when he said that. Perhaps he was like Jonah - not believing that God has the power to bring about change in the lives and hearts on the people of Nineveh. Faith is the willingness to be amazed, shocked by the surprising changes that God can bring about in our lives. Faith is the willingness to be surprised at the depth and power of God’s love for us and his constant willingness never to give up on us. Faith is the willingness to believe the power that the Gospel can have in changing the direction of our lives. Faith is the willingness to believe that with God’s power in our lives we can change. The first words Jesus preached after his baptism were “turn away from your sin and believe.” They are as relevant to us today as they were when they were first spoken. When we take God seriously, don't be surprised when he challenges us to make some radical and risky changes in our lives. In fact, just when we have our world settled, fixed, finished, God comes along with his amazing grace and turns our whole life around. That's what happened at Nineveh when Jonah preached. And that's what happens when God and his never-ending love touches our lives.